Edale - The Horseshoe walk. 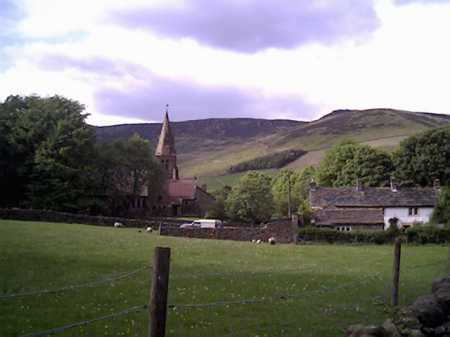 Edale is the famous starting point of the Pennine Way it is situated midway between Sheffield and Manchester in the Dark Peak. 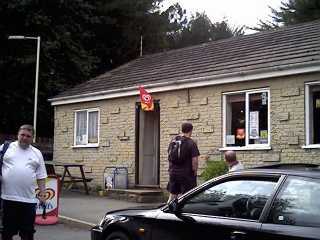 The village boasts Two pubs a cafe a post office two campsites and a peak district information center. The cafe situated next to the railway station at Edale. The Fieldhead campsite is in the grounds of the information center to visit thier website Click here. 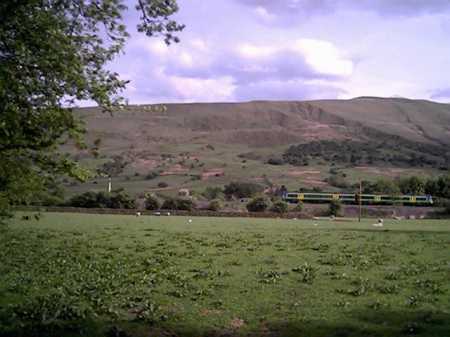 View of ridge that runs between Castleton and Edale from the Entrance to Fieldhead Information center. 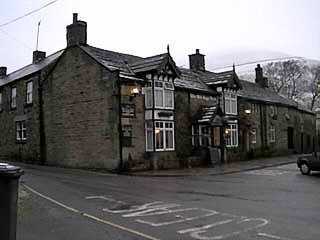 Edales other campsite is Coopers Campsite and the entrance can be found just across the road from the nags head pub. 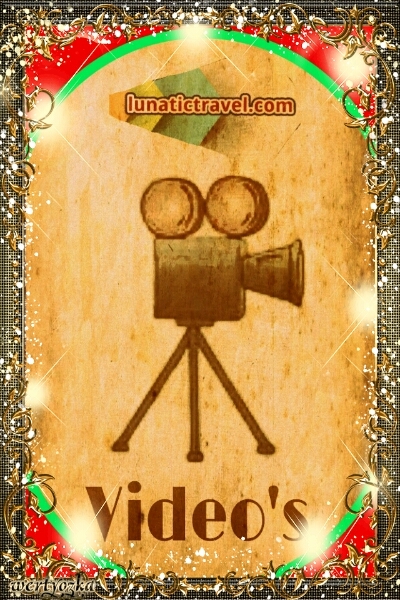 For more information on Coopers Campsite Click here. There is also various Bed and Breakfast accommodation available. 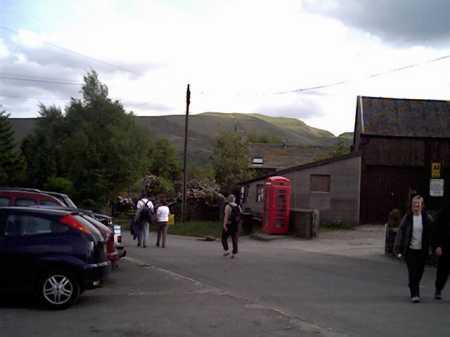 Fieldhead information center, The surrounding grounds form one of Edales campsites. 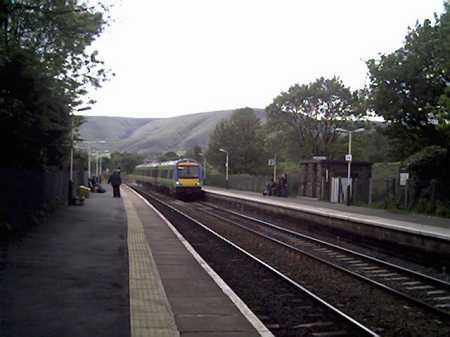 Edale can be reached on public transport by train or bus (the bus service is limited). 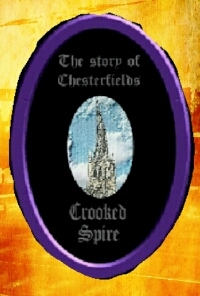 Trains can be caught from either Sheffield or Manchester about 30 minutes from Sheffield, 45 minutes from Manchester and are relitivley frequent and run from early morning to late in the evening 7 days week. 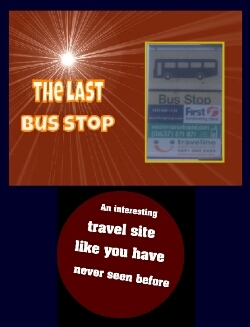 vist Traveline for more information on times. 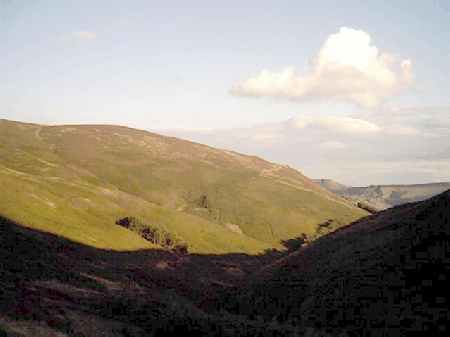 The Horseshoe Walk is a walk with many steep hills that climb onto Kinderscout the highest part of the Peak Distict. 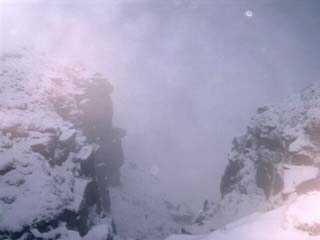 In winter be sure to have the right equipment as conditions can be arctic. 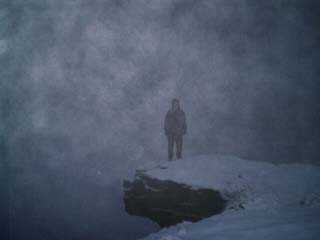 Even in Summer you should be careful as mist and rain can cause serious problems. View of Mam Tor and Mam Nic from the Nags Head Pub. 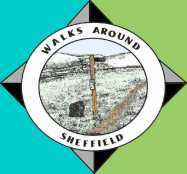 This walk begins and finishes at the nags head pub at the center of Edale village. 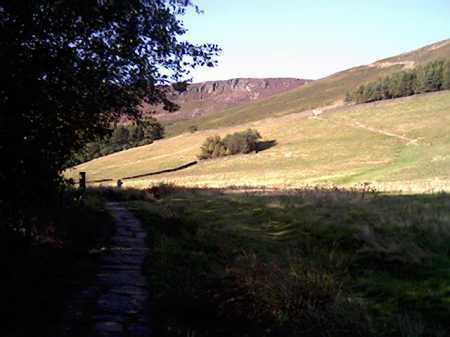 It is a round walk that follows the edge of the Grindsbrook Valley and really very simple to follow. Follow the lane past the side of the Pub this is also the main route of the Pennine Way. 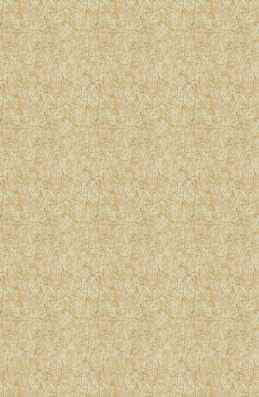 The tarmac road soon ends and a stone covered road begins. Follow this road for a short distance and a path appears on your right hand side. Follow this path it will take down to a bridge and across the river and up to a gate. Go through the gate and the path qpens up. Follow the slab path for a short distance till another path leaves on your right hand side and heads off up the hill in the direction of The Nab. This is where you leave the pennine way and follow the path up the hill towards The Nab. Path to The Nab seen from the Pennine Way. You wiil come to a stile and then the path zig zags as it climbs. the views getting ever more panoramic as you go. The views up Grindsbrook also become more magnificent. You will then come to a T junction here you turn Left. The path runs along the hillside Below Ringing Roger. Eventually it turns up the hill just before you reach a stream at Golden Clough. This is a steep climb running parallel to the stream. The path eventualy crosses the stream and then runs along the hillside in a upwards direction.This is the final climb before you reach the edge of Grindsbrook and a much more level walk. Final climb to the edge of Grindsbrook. 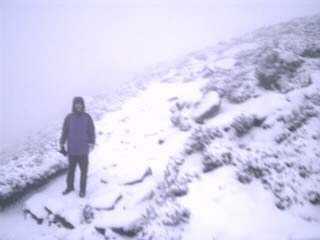 The walk now continues along the edge of Grindsbrook. There are many rocky outcrops and small valleys where sometimes streams tumble down into Grindsbrook, the views are spectacular on a clear day. 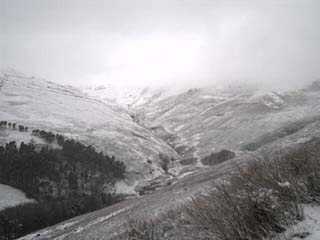 One of the small valleys falling into the Grindsbrook valley. You pass Upper Tor and eventually reach the top of the Grindsbrook valley where there is a small cairn this is also where you cross the Pennine Way. One of the Rocky Outcrops High above the Grindsbrook Valley. 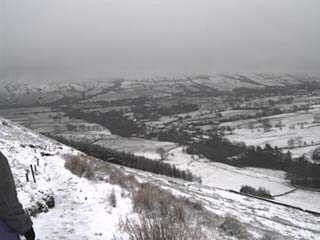 At this point you then turn down the other side of the Grindsbrook valley back towards Edale. You go past Fox holes and then climb onto Grindslow Knoll. From here again the views are Spectacular. From here you follow the path down towards Edale first across open ground and then eventually back down the hillside on the edge of Grindsbrook. You will eventually reach a stile and gate which will take you into a field and bring you to another path. heading back towards Edale. This will take you into a narrow gulley with a small stream on your left hand side which will shortly bring you out at the nags head pub. where you my wish to Participate in some well earned refreshments. 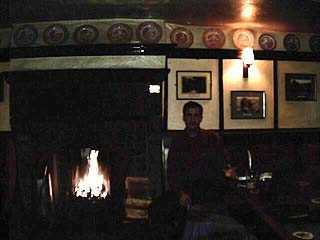 Relaxing in the Nags Head Pub. 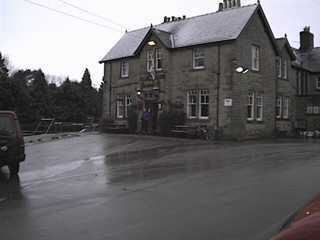 There is also the Rambler Inn that is situated next to the railway station and is ideal when waiting for a train.